A reservation can be cancelled in a patron’s record or reservation creation screen. 2) Select Other -→ Booking -→ Create or Cancel Reservations. 3) The existing reservations will appear at the bottom of the screen. 4) Highlight the reservation that you want to cancel. Click Cancel Selected. 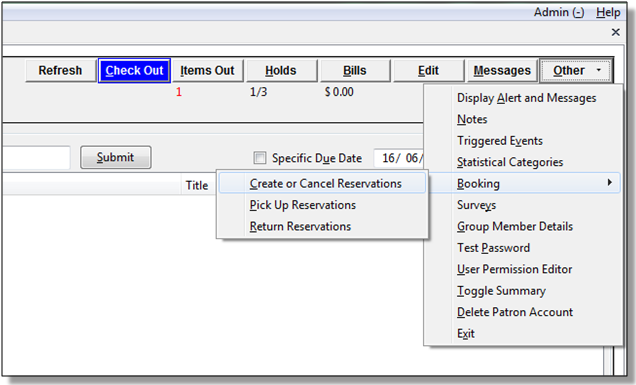 Use Shift or Ctrl on keyboard and mouse click to select multiple reservations if needed. 5) A pop-up window will confirm the cancellation. Click OK on the prompt. 6) The screen will refresh, and the cancelled reservation(s) will disappear. 1) Access the reservation creation screen by selecting Booking -→ Create Reservations. 2) Select any Bookable Resource Type, then click Next. 3) Scan or type in the patron barcode in Reserve to Patron box then hit Enter. 4) Patron’s existing reservations will display at the bottom of the screen. 5) Select those that you want to cancel, then click Cancel Selected.